PARIS — Europe’s meteorological satellite organization, Eumetsat, on Oct. 5 contracted with the European Space Agency to build Europe’s next-generation polar-orbiting weather satellites intended to operate between 2021 and around 2042. The contract for the six-satellite Metop Second Generation system — three with a payload for atmospheric sounding and optical imaging, and three with microwave-imaging sensors — was approved by Eumetsat’s member states in June. The entire program — the satellites, six launches, ground infrastructure and at least 21 years of operations — is budgeted at about 4.1 billion euros ($4.7 billion at current exchange rates). Darmstadt, Germany-based Eumetsat is responsible for about 80 percent of the budget, with ESA furnishing the rest. The relationship between the two agencies for what is also known as the European Polar System Second Generation follows a pattern developed long ago. 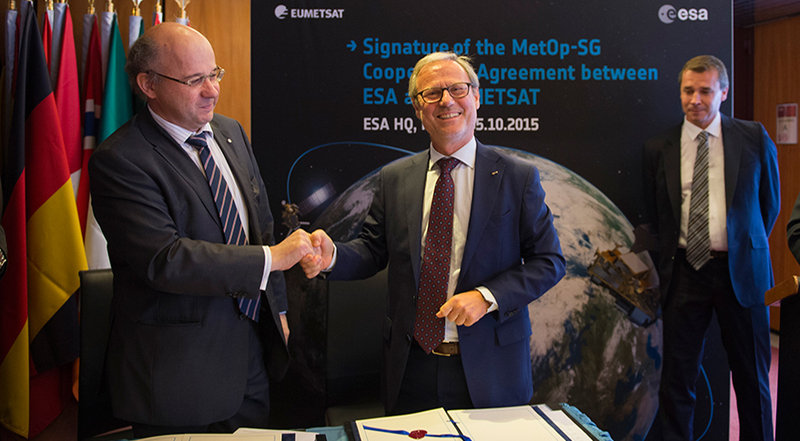 ESA and Eumetsat jointly finance development of the initial satellite models, and then ESA goes under contract to Eumetsat for provision of the remaining copies. Eumetsat handles the selection of launchers, development of the ground infrastructure and all operations. The six satellites will be manufactured by Airbus Defence and Space under a 1.3 billion-euro contract signed in October. Development of some of the payload instruments was allowed to begin pending the Eumetsat funding decision to preserve the program’s schedule margin. “We have found that when there is a schedule issue it is usually because of something with the payload, not with the platform,” ESA Earth Observation Director Volker Liebig said during the contract signing ceremony at ESA headquarters here. Liebig said the critical design review for the Airbus-built satellite platforms is expected to start by the end of the year. “The program is in good shape in terms of schedule,” he said. Alain Ratier, director-general of Eumetsat, said the agency will decide in 2019 on a launcher for the six satellites. Each Metop Second Generation satellite is expected to weigh about 4,400 kilograms, including an extra fuel load to provide for a powered atmospheric re-entry into the South Pacific Ocean at the end of its seven-year life. Given their size, the satellites might survive atmospheric re-entry and then pose a safety risk if Eumetsat simply moved them into lower orbit at the end of their service life and then allowed natural forces to pull them into the atmosphere. Their orbit and size make them too large for Europe’s Vega small-satellite launcher and a poor fit for the Ariane 5 heavy-lift rocket without a companion payload sharing the cost. That being the case, Ratier said the launcher choice likely will be between the Europeanized Russian Soyuz rocket, which Eumetsat has used before, and the SpaceX Falcon 9 vehicle. Europe’s Ariane 6 rocket, whose lighter variant is designed for missions like Eumetsat’s, is unlikely to have flown by the 2019 contract date sought by Eumetsat. “We make our selections based on reliability and price,” Ratier said. Eumetsat has refused to commit to buying European launch services, but nonetheless in recent years has never launched outside Europe except when using a Euro-Russian joint venture to secure a Soyuz launch from Russia’s Baikonur Cosmodrome in Kazakhstan. Ratier agreed that once the third and last of the first-generation Metop satellites, Metop-C, is launched in 2017 and declared operational, Eumetsat will be under little pressure to launch in 2021. What Eumetsat member governments want above all is to assure Metop service continuity. Metop-A was launched in 2006 and is still operational; Metop-B was launched in 2012. Metop-C is likely to remain operational well beyond 2021. 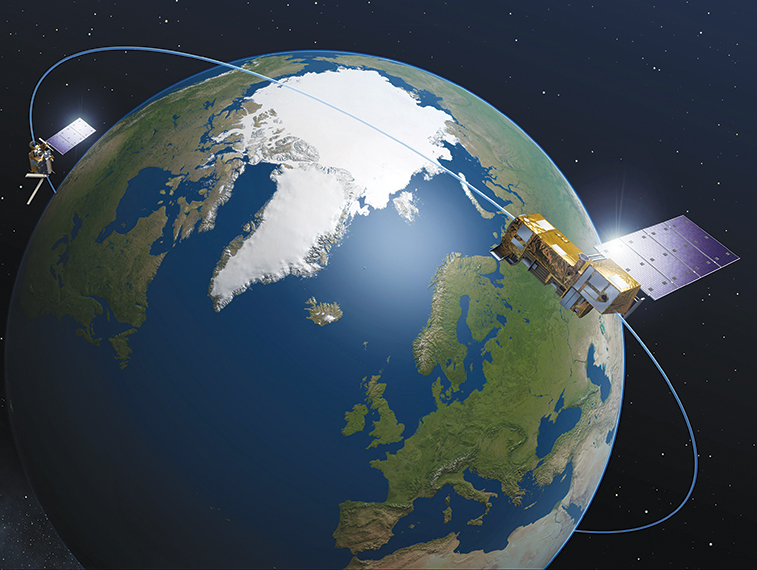 In addition to continuing Eumetsat’s core mission, the Metop Second Generation program will further develop the U.S.-European meteorological partnership in what is called the Joint Polar System. An initial joint system, featuring U.S. and European satellites, is already in operation. Ratier said that despite the annual struggle in the United States to secure a firm government budget, the U.S. National Oceanic and Atmospheric Administration — Eumetsat’s U.S. counterpart — is expected to conclude an agreement on the joint system in time for a signature in December. Further buttressing the global supply of polar-orbiting meteorological satellite data is the decision by the Chinese government to furnish China’s FY-3 spacecraft to add a third orbit to the U.S. and European spacecraft. The Chinese have accepted a request from the World Meteorological Organization to enter the polar-orbit service provision alongside the United States and Europe, a development Ratier said will materially improve global numerical weather prediction.